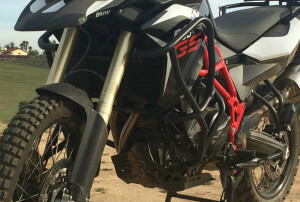 If you are like me and you are planning to take your F800GS off-road a lot, there are a few things you might want to consider. 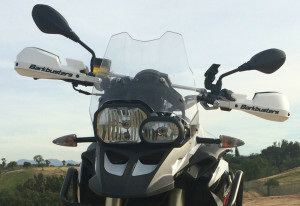 The base BMW is set up for the best possible performance on the road, hence there are no hand guards as standard, as there are no crash bars and the stock skid plate doesn’t really protect much. Some can argue that it is possible to add a whole lot of OEM accessories right when you buy it, but my question is, are those parts going to satisfy you 100%? Do you really like the way they look and feel? Because they are not really cheap and personally, if I have to spend that kind of money I want to be satisfied 100%. That’s where the aftermarket industry fits in, but I digress, let’s see what is really essential to have. 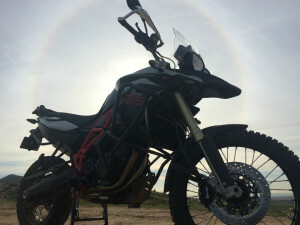 The bike itself costs a pretty penny, I want to enjoy it off-road and explore, but at the same time I want to keep it in one piece as long as possible because I can’t afford to buy another one, since I just spent thousands of dollars for it, now I’m on a budget and can’t just buy a bunch of parts, so I need to choose the best bang for the buck, and I’m not just talking about the prize alone, I need to choose those accessories that give me the most for what I use the F800 for. I gave it a lot of thought, and came to the conclusion that I absolutely need 3 components and the rest is going to have to wait until I can save some more money and buy it, in my opinion I needed a beefier skid plate, to reduce to a the chances to poke a hole into the engine (by the way, the oil filter right behind the front wheel is not optimal), a good set of crash bars to protect the upper side of the engine and somewhat the fairing, and hand guards, not because I have delicate hands and I want to safeguard them, but because if a branch catches your front brake lever, you might unwillingly perform a “superman” and fly off the bike. Depending on your comfort level, skills and type of trail you want to tackle, a knobblier set of tires might be appropriate. 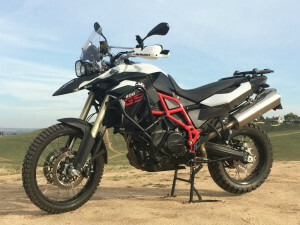 The three components I opted for to keep my budget within the $1000 mark are: HEED’s crash bars, the Altrider black skid plate and the Barkbusters hand guards. These accessories met my budget, my expectation (protection wise) and they look pretty good as well. I searched for the right bars a lot, some are great like the Touratech, but that would have depleted my founds in one sweep, some other are more affordable but they are very short, some look like you mounted moose handlers on the bike because they stick out so far, then I finally found the Heed’s bars. I looked for reviews and videos about them but I couldn’t find anything other than a bunch of people giving them a great feedback on EBay, and since the price was great I decided to risk it and buy them. So far the gamble paid off, they look good, they are the right height and they feel pretty solid (fingers crossed). Installing them was a breeze, everything fitted properly and the instruction where ok too (considering they are build in Poland where English is not the main language), I believe it only took me half a morning from unpacking to completion, so they get a big thumb up from me. This plate is great, it’s well thought, covers the important parts without adding too much weight, it’s about a quarter inch thick aluminum and the two channels on the bottom safeguard the attachment bolts while giving strength to the whole thing. Installation time was about 30 minutes, four bolts to remove the OEM plate and four plus two to install the Altrider one, construction and installation instructions are impeccable, just what you would expect from a solid manufacturer. So if you are looking for a great Skidplate that won’t break the bank, this is the one. To be specific, the VPS hand guard kit. This kit includes 2 components, the aluminum frame/bracket and the plastic guards. The aluminum frame is well built and is a direct fit over bar ends, just remove the OEM bolt and replace it with the one provided, it takes a little fiddling to find the perfect position and they can be adjusted according to personal preference. The plastic guards screw into the bracket and provide just the right amount of protection, they come with a little spoiler that can be adjusted in 3 different positions or removed all together, so you can increase or decrease the protection from the elements you require. Installation time is about 1 hour, most of which is spent trying to find the perfect position. BONUS TIP: The top side of the inner clamps has about an 1/8 of an inch gap that I used to attach a crossbar made out of aluminum tubing, this bar can be used as a GPS mount or whatever else you want it to be. 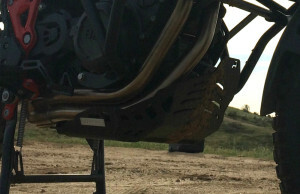 In conclusion, the parts and accessories that I would like to add to the bike are almost an infinite list, but the very least you need to safe guard your precious baby off-road are those 3 main components. This point can be argued to oblivion and obviously this is just my opinion, but I’m not just saying it, I did it myself and so far is being working, so use this article to make an educated decision using my personal experience and let me know how it turn out.